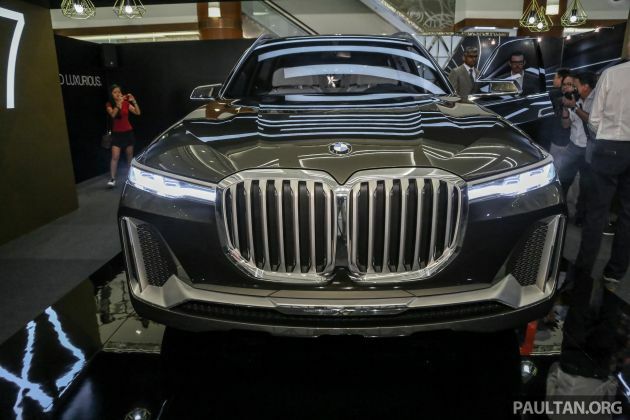 The BMW Concept X7 iPerformance is making its first appearance in Southeast Asia in Kuala Lumpur, where it’s the showpiece of the BMW X Range Roadshow at Bangsar Shopping Centre. The concept car, first unveiled in Frankfurt last year, will be here at BSC till Sunday. The BMW Concept X7 iPerformance is a preview of what’s to come from Munich – a flagship SUV that sits above the X5 and “a whole new take on luxury for the BMW brand.” The production X7 is set for a late-2018 debut and 2019 market launch, spearheading Munich’s new push to grow its presence in the luxury class. The new 8 Series is another arrow. “Luxury has a whole new meaning. At BMW, we understand this as the ability to have time for you, for other people, and for other things. Luxury is the ability to define an experience. This new luxury was first unveiled at the BMW Luxury Excellence Pavilion through the BMW Concept 8 Series early this year. 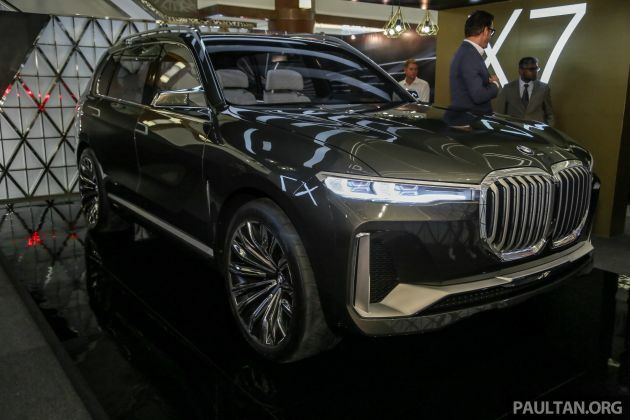 Now, we are proud to once again share this vision of progressive luxury through the BMW Concept X7 iPerformance,” said Harald Hoelzl, MD and CEO of BMW Group Malaysia. The Concept X7 looks very bold, to say the least. “The new BMW design language employs just a few, extremely precise lines and subtle surface-work to raise the bar in terms of presence and prestige. 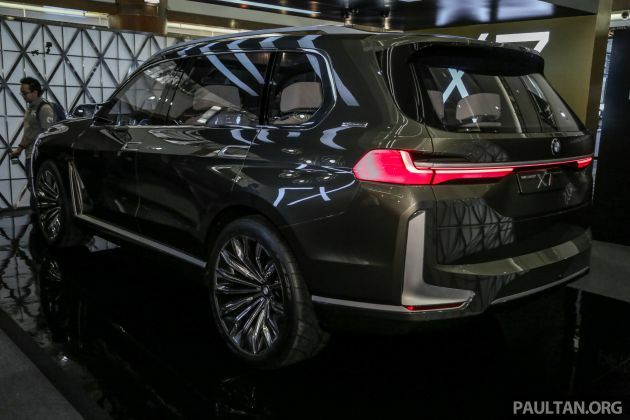 The BMW Concept X7 has a luxurious and sophisticated feel to it, thanks to its understated use of forms and incredibly precise details,” explained Adrian van Hooydonk, senior VP at BMW Group Design. Yes, but it’s that nose that will hog attention. The large, vertical kidney grille on the upright front-end has a frame and bars that are single-piece and solid in design, as if hewn from a single piece. There are contrasts between gleaming edges and matte surfaces. The laser headlights, on the other hand, are very slim and have blue X signatures within. A prominent bar extends across the full width of the front apron, before rising vertically to frame the air intakes. A less exaggerated version of this face is worn by the just-unveiled fourth-gen G05 BMW X5. On the flanks, a chrome strip in the door sills frames the Air Breathers in a vertical accent, following the front-end look. For the first time in an X model, the wheel arches feature a circular cut. Those multi-spoke wheels are 23-inch items. At the back, vertical aero lips mark out the rear clearly from the flanks. The slim rear lights, which sport a 3D L-shape, break up the body volumes and a chrome bar connects the two sides. A bird’s-eye view of the X7 Concept reveals the glass roof’s transparent, Y-shaped supporting structure. BMW says that the X7’s sheer size gives it an interior experience unmatched by any BMW, past or present. It sits six in a 2-2-2 formation, and four of the chairs have a four an exclusive individual design. Dark, olive-bronze leather with discreet gold pigmentation covers the seat bolsters. Smoke White leather cover the remainder of the seats, and hide is also found on the shell-like backs of the individual seats. The large panoramic roof gives the interior a light and airy, open-to-the-sky feel. At night, one can observe strands of laser light in the roof. The cockpit retains a driver focus that will be familiar to BMW customers. As with recent concepts, there’s a “wrap around” for the driver, and this giant of a car provides a great view out from its raised seating position. The “reduced to the essentials” instrument panel is a 12.3-inch screen that visually connects to the central touchscreen. 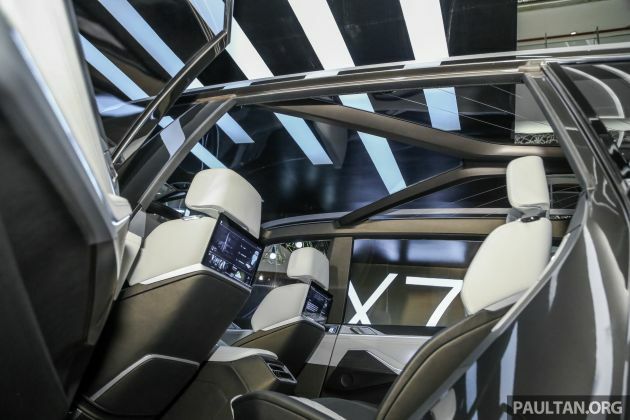 BMW says that a new operating concept allows interactive use of the two displays. Partially backlit crystal glass in the dark Silver Night shade lends a sophisticated feel to control elements like the selector lever, iDrive Controller and steering wheel buttons. Aside from spyshots, we’ve seen the actual upcoming X7 via official BMW released images of pre-production models at its plant in Spartanburg, USA. The images, which we’ve included in the gallery below, show the entire front end of the car, which retains much of the design elements found on the Concept X7. There are also a couple of images that show bits of the interior, including a new gearlever with jewel-like facets, redesigned switchgear, relocated starter button and larger iDrive rotary controller. There’s also a panoramic sunroof, with a separate moonroof for the third-row passengers. Initial details from an early test drive of prototype units by selected media reveal that the production X7 is physically imposing (5,100 mm long, 2,020 mm wide, 1,800 mm tall, 3,010 mm wheelbase) and will have a couple of variants – M50d, xDrive40i, xDrive50i and xDrive30d, in addition to the iPerformance plug-in hybrid. There will also be a six-seat option as seen on the concept, where two individual seats occupy the second row in place of a bench. It’s quite a sight, so head up to BSC for a closer look at the BMW Concept X7 iPerformance, which will be here till this Sunday. Also on display are the F48 BMW X1, F39 BMW X2, G01 BMW X3 and the F15 BMW X5 – click on the links for our reviews. ckd BMW X7 iPerformance hybrid $588K. “Yes, but it’s that nose that will hog attention”. Good one but now it reminds me of Pumba. At some angle it’s so ugly, at some angle it’s handsome. OMG. This must be the oddest/ugliest kidney I’ve come across. This thing is huuuuuuge. It’s not going to fit into our parking lots. Valet parking for me anytime. The front looks very different from existing BMW… but the huge kidney grill looks ugly IMHO. The looks… is a definite fail..
Gosh! This is the most unique & strangest looking BMW to date..